A governor’s entourage is passing through the streets in a city of medieval India. The valets are shouting at the people to get them out of the way. Unmindful of this is a Sufi, walking along the road, preoccupied with the discourses of his master. He fails to step aside and receives the wrath of the governor’s staff. The king trembles in every limb. He arrests the governor. 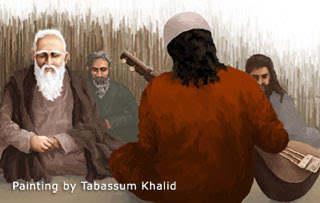 As an ambassador to the angry master he sends Khusrau, the legendary poet-musician, who was himself a Sufi. The master melts upon hearing sweet music. “One strain of poetry bought the grace of a kingdom that was firm as a mountain,” the Poet comments. You can see the relationship between Sufism and qalandars. The first was a secret closely guarded by those who knew it best. Qalandars were like bolts of lightening occasionally revealing this secret, but only in a flash that would be gone before the bystander could make out the complete picture. Genuine Sufism was about strengthening of the self through love, and about ruling over “the outward and the inward forces of the universe.” Mysticism associated with weakness, inaction and renunciation turns out to be counterfeit as you enter the next chapter. This is a very interesting post Mr. Shafique.Ever since I have started learning about Iqbal,I have begun to question some of the attitudes of the wealthy against the poor.This probably has been there since the beginning of time. It did not bother me that much then as it does now.I am glad the story had the Qalander in it and justice was done. By studying about Iqbal I have learned lot more about religion,sufism and selflessness,which had never knocked my door before. Now when I read something I do try to go deep in my thoughts to find the true meaning.I have learned to appreciate everything around me. Thank you very much for your hard work I am looking forward to broadening my horizon.